2017 has been a strange year in the world’s biggest MMA promotion. Titles have changed hands, dominant champions have been dethroned, there has been the return of a legend and a notable absence of the biggest star in the sport. We are no closer to an ETA on the return of Conor McGregor. The UFC’s undisputed champion of pay-per-views has still yet to defend a title in the promotion, despite enjoying an unbroken status of champion since Dec. 2015. While many had believed that the Irishman would return at next month’s UFC 219 against interim champion Tony Ferguson, “The Notorious” had other ideas. These days, McGregor makes the headlines for reasons other than his fighting activity. Jose Aldo, the man who had a 10-year unbeaten record smashed in just 13-seconds by the incumbent lightweight champion, exited Little Caesar’s Arena in Detroit, Michigan a shadow of the man who had reigned over the 145-pound division prior to McGregor’s arrival. Having shown some brief glimpses of his capability against Max Holloway, it was clear that the fighter many still regard as the greatest featherweight of all time was no longer there. Holloway effectively beat Aldo to a pulp and quickly sobered those who believed that “Scarface” would demonstrate that he was back to his best. As for Holloway, we watched a 25-year-old with the potential to become the greatest fighter who has ever competed in the UFC. “Blessed” dismantled and clearly beat Aldo for a second time in six months, with many questioning just how much of Aldo’s decline is attributed to Holloway’s dominance. Holloway, the unassuming and deeply modest fighter, may not have the backstory, attitude or loud mouth many see as a prerequisite to earning big paydays and enamoring oneself to the lovers and haters who part with their money to watch fighters win or lose. What the Hawaiian does have, however, is an appeal to true fans of the sport. The big name on most fans’ lips following the conclusion of UFC 218 is Francis Ngannou. Ngannou’ brutal knockout of Alistair Overeem introduced many fans to the hype surrounding the man who many believe will find his way to the UFC heavyweight title sooner rather than later. 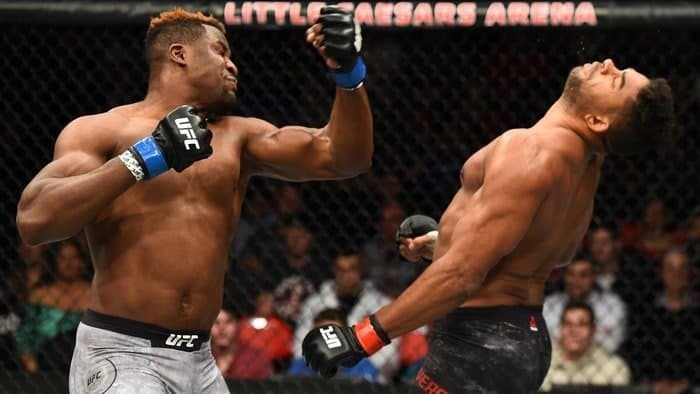 Ngannou’s powerful left hook which connected in a spectacular fashion with Overeem was enough to bring that hype to a level which has not been seen for such a long time in an MMA heavyweight. Ngannou has the capability to not just embark on a run which will see him amass a succession of title defenses but become the first African superstar on the roster and a bonafide heavyweight legend.